Ohper is a Nox. He is part of the small group living in harmony with the Nox homeworld's nature. 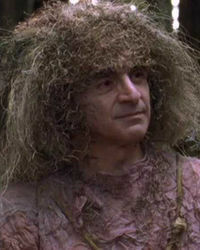 According to Earth calendar, Ohper is born circa 1565, making him one of the eldest among the Nox (SG1: "The Nox"). On the Nox homeworld, Ohper is the first Nox to welcome SG-1 after their resurrection. When trying to express his "ways" to the Nox, Colonel Jack O'Neill asks Anteaus if they have some elders he can speak with. Anteaus introduces Ohper as one of the eldest among the Nox. Later, in the forest, Daniel Jackson is speaking with Ohper, trying to understand and gather some knowledge, stating that they are eager to learn from other races. According to Ohper knowledge takes time, even many years to learn. Jackson is amazed to learn that, according to Earth timeline, Ohper is 432 years old. Jackson also learns that the Goa'uld tried to capture a fenri as long as Ohper can remember. Later, along with Anteaus and Nafrayu, they practise their ritual of life on Lya who has been hit by Shak'l. After Lya's revival, Ohper and Nafrayu bring her inside a hut. Later again Ohper, Lya and Anteaus practise another ritual of life on Nafrayu who has been hit by Apophis's Goa'uld hand device. Lya and Ohper are disturbed by the Goa'uld staff weapon's blasts they can hear. Anteaus takes their hand and they resume the ritual. "Ohper"'s spelling is from the DVD's English subtitles. As the other Nox, Ohper is very quick to learn English language (only a couple of minutes), and is able to almost instantly calculate his age according to Earth timeline. Ray Xifo, Ohper's portayer, will portay another humanoid in 2000, Abarca, in an episode of Star Trek: Voyager, "Virtuoso"
This page was last edited on 26 October 2014, at 18:11.